Pets can become lost for a variety of reasons, and not all disappearances end in tragedy. Dogs most often get lost when they wander out through doors, windows, or fence gates left open by guests. Dogs may also escape through flimsy screens or broken fences, or dig their way out from under fences. Cats are often chased by another animal, after which they can become frightened and disoriented, unable to find their way home. Many cats also enter the homes, sheds, and garages of neighbours and get locked in accidentally. And of course well-meaning individuals may mistake a cat that is not wearing a collar for a stray and bring her home or to a local animal shelter. You can increase the likelihood of getting your lost pet back by taking the following actions as soon as possible. Start with a thorough search of your home and grounds, checking closets, boxes, under beds, washing machines, garages, sheds, hedges, etc. Next, search the neighbourhood calling your cat or dog. If you have recently adopted your pet, check to see if she has returned to her previous home. Create a “lost pet” poster with very specific information about size, markings, breed, notable personality quirks, etc., along with your phone number and e-mail address. Add colour photos and offer a reward if possible. Put posters up all over the neighbourhood on posts and bulletin boards at local supermarkets, churches, pet supply stores, veterinary clinics, animal shelters, community centers, and other high-traffic locations. Ask if you may put up posters at nearby schools – children tend to pay more attention to animals than adults. Check posts and local bulletin boards regularly for “found cat” and “found dog” posters. Go door to door with photos of your cat and ask neighbours to check their garages and sheds. Put your “lost pet” poster through mail slots at houses where no one is home. Talk to delivery people who do regular rounds, such as postmen and newspaper carriers, and ask them to keep an eye out. Inform local veterinarians, animal shelter personnel, and animal welfare groups, and provide pictures of your pet so that staff will recognize her if someone turns her in. Place an ad in your local newspaper and regularly check local “lost and found” columns. Post on the Pets.ca “Lost and Found” pets forum, Craigslist, and any other lost-and-found pet forums you can find online. Check if any local animal rescue organizations or veterinarians have “lost pet” sections on their websites and supply a photo and contact information for any that do. Come outside the door and call to your pet at regular intervals, particularly in the evening. Clink a bowl on the ground and leave some food or your pet’s favourite treats just outside the door. A familiar territory marker may help to lure the cat or dog home. For a cat, try placing the litter box outside (but not right near the food bowl). Cut a hole in a cardboard box just large enough for your pet to get inside. Put her bed or something else she sleeps on regularly and/or something you have worn inside the box and put it just outside the door or in the yard. Put a tarp or other shelter over the box if your porch/deck/doorway is not covered. If your cat or dog comes home on her own or is returned, remove all posters, inform all authorities you have previously contacted, and, if time permits, put up a few posters letting others know that your pet has been found. Animal lovers may be still keeping an eye out, and many people will appreciate a story with a happy ending, particularly those who are anxiously searching for their own missing pets. Ensure that pets always wear up-to-date ID tags. Have pets tattooed and microchipped – with microchipping, a pet may even be returned from another country if she has stowed away on a truck or ship. Have pets neutered and spayed to reduce the likelihood of roaming and serious fights. Keep cats indoors or provide an outdoor cat run, enclosure, or cat fence. Keep dogs leashed when bringing them outdoors, and make sure fences are secure if they have a free run of the yard. Be aware of the dangers posed by pet thieves. Support legislation that aims to eliminate licenses for Class B animal dealers, who frequently steal pets from yards and neighbourhood streets and sell them for experimentation. Advocate for tougher animal cruelty laws. Encourage others to do likewise by informing them about the link between animal cruelty and violence toward people. Unfortunately, not all pet loss stories have happy endings, but there have been many cats and dogs that have been reunited with their owners even after being missing for more than a year. In one remarkable case, a woman ended up readopting a cat she had lost many years previously after finding him at the SPCA where she was looking to adopt a new cat. In another happy tale, a cat travelled through 1,000 miles of Australian outback to be reunited with his owners. Hartwell, S. (2007). 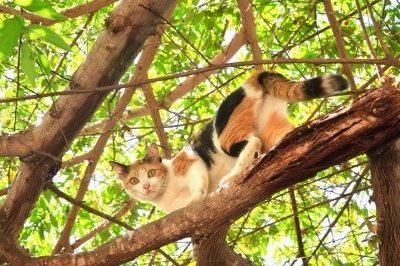 “What to Do if Your Cat Goes Missing.” MessyBeast.com. Sands, David, Dr. (2005). Cats: 500 Questions Answered. London: Octopus Publishing Group.